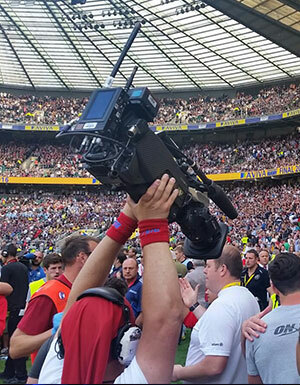 The Aviva Rugby Premiership Final at Twickenham was not just a high profile 4K event, it was a multi-camera event using a selection of specialist RF cameras - making it a showcase for the latest RF and mobile camera technology. The main cameras were Sony HDC-2500 and PMW-F55 4k, but as there are no mini 4K cameras to match these, BSI used their own specialist RF cameras for certain extreme shots and original angles, and the Real Freedom roaming cameras to send 1080p50 feeds direct to the mixer where they were up-scaled directly to 4K. The Ref-Cam brings the viewers closer into the game and gives more of an on-pitch experience. It can get closer than a Steadicam rig, and as it always follows the match from the referee's point of view, it captures important shots which even viewers in the stadium may not always be able to see. To work successfully, it has to capture the referee's view of the game without ever getting in the way. BSI's Ref-Cam is a fully featured professional miniature point of view camera with remote Iris control, and full paint control including master black, detail, RGB colours and saturation. This means that the camera parameters can be finally adjusted, and the image can be matched to the other cameras as light conditions change. The BSI dual stream mini RF link uses the latest MPEG-4 encoding and supports two live HD feeds together with camera data. Modulation, RF power levels, and other critical transmitter parameters are all controlled remotely, which means there's never any need to delay the game just to adjust the referee's camera. While the Ref-Cam was developed for Rugby, it makes a great difference in other situations. For example, it was used in dual stream mode with two live cameras to get the "flip-flop" shot of the dogs running through tunnels at Crufts - as it could capture both the front and back of the tunnels and flip between the two, as used track side in motor racing applications. BSI has developed a unique camera to capture the line-out throw. It's a completely wirelessly operated camera mounted on a pole, which they have named the "Line-Out" camera. As you would expect, it has Pan, Tilt, Zoom and Focus, but an important difference is that it has a "Roll" feature as well, so that the pole operator doesn't have to worry about whether the camera is level - the shot will always be useable. It is in regular use for rugby, for getting the top shots of the line-out throw following the flight of the ball. The next BSI camera at Twickenham was the "MOVI", a camera designed to be used on a light weight frame with a stabilised gimbal, which always rolls to a level position and provides very useable live shots with the added bonus of camera control and Iris control. This camera can also be anchored under a drone. Three of BSI's own Real Freedom RF systems, two handheld and the third on a Steadicam rig, were used for the roving cameras and close-up shots around the pitch. They have full camera control, and operate in the 1080p50 3G format. This is a higher quality video format compared to the standard 1080i signal which can be up-scaled to 4K for live transmission, but is easily handled by the existing mixers - a practical hybrid solution for 4K at this stage in its evolution. With these, BSI also provided two wireless HD return vision monitors to show the programme feed to the presenters. The backbone infrastructure was a fibre network with multiple receive points, one each side of the stadium plus external sites - each with dual receive antennas transporting the RF signals from all the various camera systems including - the radio cameras, the line-out camera, the ref-Cam, and the FS700 SloMo cameras - all down the fibre network. "The Real Freedom systems are fully integrated, with camera control, return vision and telemetry built in, so they are very easy to use - which is great for the production companies. All of the RF systems at Twickenham were from our own stock of systems designed and built in house. This was a 4K production, and it was also the first major event since our company's re-organisation and a new management line-up in the UK." Tony Valentino is Technical Director of Broadcast Sports Inc. (BSI) which hires specialist camera and audio equipment for television broadcasting. For more information, please see www.broadcastsportsinc.com.